For many organizations, the prevailing impact of DevOps on service delivery within ITSM is more prominent now than ever before. When your Dev, Ops or both processes are outsourced to one or multiple vendors, it complicates everything for your organization, its users and leadership even more. Add to that the increased importance placed upon service teams to improve customer experience and you can see how ITSM and DevOps are siloes that must be broken down. Knowing where DevOps, ITSM and business principles originate and how to align them is a first step towards better service delivery. However, achieving a truly excellent customer experience takes radical transparency throughout the entire service chain. 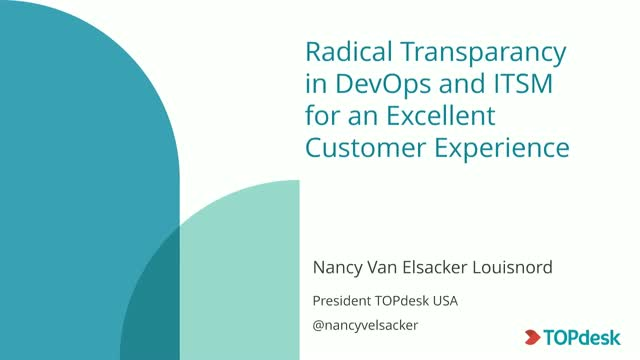 In this presentation, Nancy will walk you through the varying steps you can take to achieve excellent customer experience by aligning DevOps and ITSM. She will define what radical transparency looks like at the various parts of the chain -- whether your Dev, Ops or ITSM processes are in-house or outsourced. Nancy Van Elsacker Louisnord is the president TOPdesk USA. She’s also a public speaker, a contributor to numerous leading industry publications and a service management expert.